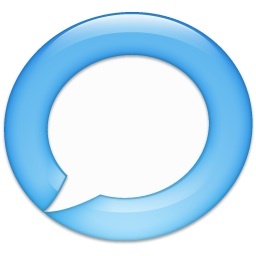 I am very fond of twitter but was falling short of time so checked my twitter account only once in a week.But now life will be different with the Echofon firefox add-on. Echofon for Firefox is an extension that adds a tiny icon to the status bar. You can get notified about every time friends post tweets and has a text entry field for posting your own tweets . You can use Echofon for iPhone as well. Echofon for Firefox syncs unread tweets with your iPhone when you use Echofon for iPhone. 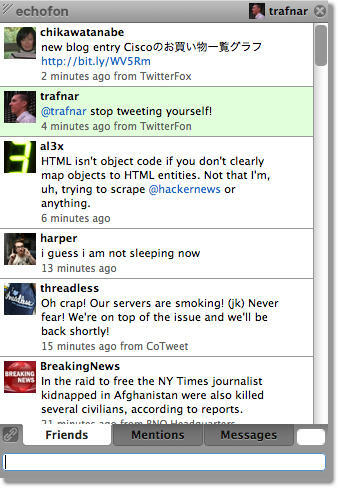 Previously Echofon for iPhone was called “TwitterFon” and Echofon for Firefox was called “TwitterFox”. 1) It saves me the time of refreshing the twitter account to see new tweets. 2) Unread count in Firefox status bar. 3) One-click access to Twitter window. 4) Easily post links to current page in Firefox. 5) Instant notification of new Tweets, within Firefox. 6) Allows for multiple Twitter accounts. 7) Handles all the standard Twitter tasks such as direct messages and mentions. So Friends, if you want to get notified each time when you recieve a new tweet,then Install the Echofon. You can add a custom sound clip for new alerts. For each new tweet, the sound will be played. You can check more details about echofon on their homepage. So HAPPY TWEETING.